Don’t know what Cubivore is? It’s no surprise, as it’s probably the rarest GameCube game ever made. If you can find it used, the game fetches for $30 at local game stores. It was developed by Japanese developer Saru Brunei, and it was dead in the water before it was even released in 2002, mostly due to its extremely basic graphical presentation. It first started out as an N64 title, but was later released on the GC. Sadly, the graphics were never really spruced up for the new hardware. The name says it all; everything in the game, from the land to enemies, are all made of cubes. Even the Sun is a cube, with a low-res red circle on it. It’s all very stylistic, but Crysis this is not. Gamers that are only entertained when they’re looking at normal-mapped textures probably never knew of Cubivore, which is sad. Cubivore is an extremely original game that any serious gamer should try out at least once. Cubivore is simple in the visuals department, but complex in the gameplay one. As a lonely and young cube, you decide when you’re born that you want to become the King Cubivore. But standing in your way is the Killer Cubivore, a monstrous beast that is the strongest of all cubivores. To face the Killer Cubivore, you must grow and earn the power to fight him. Which basically means killing every cubivore in your way. As you kill more, you “mutate” into different forms, with some of the mutations stronger than others. You also get to “mate” with female cubivores. The more kills you get, the more manly you appear to the females. Once the dirty deed is done, the female(s) spurts out a kid, sometimes with a new extremity to advance the species. Crazy thing here is that you, the father, die, and now control the kid. I guess it’s some form of reincarnation, as the child talks as if it were still the same character as before. It’s something I’ve never seen in a video game before, and I’m still taken aback by it all. There are a few other really weird things in the game, but I want you to check them out for yourselves. The game reminds me a lot of Pikmin, with the whole “nature is scary” motif, but it’s not as much of an RTS. 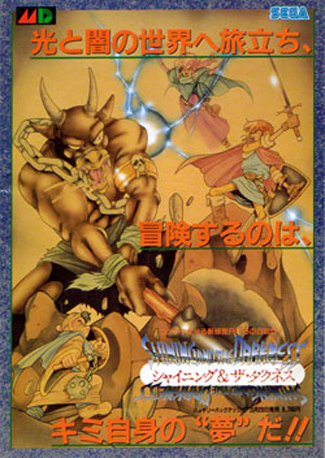 The combat is like a basic Zelda, with an L-lock control scheme. It’s a little clunky, but it gets the job done. It gets better as you grow and mutate, giving you stronger biting attacks (which is the only form of attack), but it takes an hour or so to get interesting. In the two or three hours I’ve put into it, I’ve gone from a weak little Pig cube to a rather formidable Bear one. The game is definitely a surreal experience, but I can totally see this game on the DS. 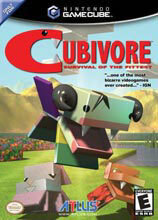 That system is crying out for a game like Cubivore. Pity we’ll never see it though.